A bioprospecting expedition to Iceland's famed hot springs has yielded new strains of bacteria with potential of producing biohydrogen (H2) and ethanol (EtOH) fuels from biomass and waste materials containing carbohydrates. The report about the discovery of the new thermophilic microbes appeared online as an open access article in Energy & Fuels, a bi-monthly journal. This is yet another illustration of how investigating life in extreme environments may yield applications in the emerging bioeconomy. Knowing that thermophilic, or heat-loving, bacteria inhabit Iceland's hot springs, the scientists bioprospected scalding-hot geothermal springs in different parts of the country for new ethanol and hydrogen-producing bacteria. After screening samples, including those from springs that approached the boiling point of water, the scientists enriched promising microorganisms that can produce the compounds from glucose or cellulose at high temperatures. The enrichments included those with unusually high yields of hydrogen or ethanol from carbohydrates. Hydrogen and EtOH production by 9HG was characterized further in a continuous-flow bioreactor at 74 °C. The highest H2 and EtOH yields of 9HG were obtained at pH 6.8 ± 0.3. Lactate production decreased the H2 and EtOH yields in the continuous-flow bioreactor, and the yields were lower than those obtained in the batch fermentations. In conclusion, the thorough batch screening of Icelandic hot spring samples indicated promising enrichments for H2 or H2 plus EtOH production from carbohydrate materials. Eurekalert: Bioprospectors identify hot new biofuel-producing bacteria - December 3, 2007. Deforestation in tropical countries is often driven by the economic reality that forests are worth more dead than alive. But a new study by an international consortium of researchers has found that the emerging market for carbon credits has the potential to radically alter that equation. By putting a price on carbon sequestered in forests, they would be worth more intact than the profits from the products generated from deforestation. However, the study did not take into account the emergence of carbon negative bioenergy production, which complicates the calculation even further. But then, the concept of negative emissions energy remains abstract, while deforestation is extremely concrete and must be tackled now. The 'virtual threat' of carbon negative bioenergy to any scheme aimed at compensating avoided deforestation, should remain virtual. It should not be seen as a barrier to policy makers who want to incorporate such avoided deforestation schemes within the new, post-Kyoto framework on strategies to reduce greenhouse gas emissions. The new study, which was released this week at UNFCC Conference of Parties (COP-13) in Bali, compared the financial gains generated by deforestation over the last 10 to 20 years in areas of Southeast Asia, Central Africa and the Amazon Basin - most of it driven by a desire for farm land or timber - to the amount carbon that was released by the destruction. That comparison has become critically important because many industries in developed countries are set to spend billions of dollars to meet new requirements for curbing greenhouse gases by purchasing carbon credits tied to reductions elsewhere. The researchers - who conducted the study under the Partnership for Tropical Forest Margins (ASB) - found that in most areas studied, the various ventures that prompted deforestation are always the result of a rational calculation. But when the prospect of a carbon price attached to the forests is taken into account, these ventures rarely generated more than $5 for every ton of carbon they released and frequently returned far less than US $1. Meanwhile, European buyers are currently paying 23 euros (about US $35) for an offset tied to a one-ton reduction in carbon. Developing new incentives for reducing carbon emissions stemming from deforestation is high on the agenda in Bali. Deforestation is rampant in places like Indonesia, the Amazon and the Congo. Currently, confusion over how to value and monitor the large amounts of carbon stored in tropical forests has prevented the inclusion of forests in the carbon offset market that is mainly dominated by reductions achieved in the industrial sector, even though deforestation is responsible for some 20 percent of the world's carbon emissions. They found that in most instances at the sites in Indonesia, deforestation returned less than $5 per ton of carbon released and in some areas, less than $1. For example, in forested areas rich in peat, which is particularly efficient at trapping carbon, the figure was about $0.10 to $0.20 per ton. Meanwhile, an analysis of deforestation in the Amazonian forests of the Ucayali Province of Peru produced similar results. Most of the deforestation, which was mainly driven by a desire for crop land, generated less than US $5 per ton of carbon released. The Cameroon study sites produced a better return. Deforestation returns about US $11 per ton of carbon emissions, which is mainly due to an increase in secondary forest and the fact that in Cameroon, cocoa production - which elsewhere has decimated tropical forests - has tended to occur within forests, and resulted in more in forest degradation than outright deforestation. The report notes that offering economic rewards for carbon storage could be effective not only at encouraging conservation but also at encouraging activities in deforested areas that can recoup at least some of the lost carbon. For example, research shows that agroforestry, which encourages a broader use of trees on farms, can offer a win-win situation of improving smallholder incomes and absorbing carbon. Dennis Garrity, Director General of the Nairobi, Kenya-based World Agroforestry Centre said that, not only does agroforestry have the potential to store carbon, it also addresses the need for alternative livelihoods amongst populations who currently benefit from deforestation. Researchers caution that despite the clear benefits to be derived from assigning carbon credits to conserving forests, implementing a forest-based carbon market will be complicated. Biopact has however added an entirely new perspective to the discussion of the value of forests when they are seen as carbon sinks. The new report shows that keeping forests intact brings in more potential revenue from carbon credits than revenues obtained from products generated on the basis of deforestation. But this equation changes dramatically when the same logic were to be applied to the potential for the production of carbon negative bioenergy and fuels. Carbon negative bioenergy takes far more carbon dioxide out of the atmosphere, than intact forests ever can. To understand this, one has to look at the concept in its most radical form: suppose one deforests an area to grow energy crops on them. These crops are then utilized to generate electricity, in biomass power plants. But when the carbon dioxide released during this process is consequently captured and stored (CCS) in geological formations (such as depleted oil and gas fields, or saline aquifers), you generate "negative emissions". In such a system, you actually take carbon dioxide out of the atmosphere. How much? Researchers have found that in a Biomass Integrated Gasification Combined Cycle (BIGCC) plant, one can generate minus 1030 grams of CO2 per kilowatt hour of electricity thus produced with the CO2 sequestered underground. Electricity from coal generates around 800 grams per kWh - the difference thus being around 1830 grams. One hectare of high carbon storing eucalyptus trees yielding 15 dry tons per hectare per year over a rotation period of 3 to 5 years, with an energy content of 17 GJ per ton, utilized in a BIGCC coupled to a CCS system with an overall efficiency (from plantation to sequestration) of 33%, would offset around 45 tons of CO2 compared to electricity generated from coal. Per year, the carbon negative energy system would sequester around 24 tons of CO2 per hectare (or 6.5 ton of C). 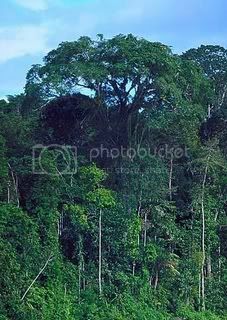 A mature rainforest only sequesters about 0.5 tons C per hectare per year (1.8 ton of CO2 equivalent). If the original forest that were to be cleared, were to be used as a biomass feed for the production of carbon negative electricity, the advantage of such a system would be immediately present from year zero. If the forest is burned without the energy being used for the production of electricity, as is currently done in deforestation operations, it would be releasing all of its carbon into the atmosphere (250 tons of C per hectare or around 916 tons of CO2 per hectare). It would then take around 20 years of operating the carbon negative energy system to break even. When sugarcane is used and fermented into biogas, more carbon dioxide can be captured in a far less costly way compared to utilizing woody biomass in a BIGCC (because capturing CO2 from biogas is much more straightforward than via the gasification and gas shifting process). Many other future concepts are thinkable, with the most radical being the production of carbon negative hydrogen from biomass, which would be a transportable fuel that yields high amounts of negative emissions each time it is used. So what does all of this mean? It implies that there are land use strategies - such as the production of energy crops for the production of negative emissions energy - that could compete with any scheme to avoid deforestation, purely on economic terms. Biopact was interviewed about the threats posed by this alternative land use strategy for 'compensated reduction' or 'avoided deforestation' schemes. In the interview, we advocated the inclusion of other compensation schemes for communities willing to protect their forests: the biodiversity and ecosystem services of forests need to be expressed in monetary terms too, and must be made bankable. Otherwise, merely putting a price on the carbon sequestered in forests might not suffice. However, it must be said that the production of negative emissions energy is, for the time being, only a concept. The 'virtual' value of this form of energy should be part of the discussion of the value of forests and of how to calculate it in a context of an emerging global carbon market, but it should not be a barrier to the implementation of avoided deforestation schemes. Biopact is currently helping write a paper about the topic, to appear in a major energy journal next year. In conclusion, nobody in his right mind can advocate deforestation for the production of food, forest products or energy when the prospect of a 'compensated reduction' scheme based on a carbon price is so close at hand - and certainly not now that the research discussed above so clearly indicates that avoided deforestation would be more profitable. Policy makers and delegates in Bali must succeed in approving a framework that compensates communities and nations willing to avoid deforestation. The "threat" of carbon negative energy to such schemes remains purely abstract, while deforestation is extremely concrete and needs to be tackled now. The fact that the countless ecosystems services and biodiversity provided by tropical rainforests are not 'bankable' yet - which would be a requirement if compensated reduction schemes want to be able to compete with carbon negative bioenergy -, should not be seen as a barrier to implementing such schemes. The study was conducted by the World Agroforestry Center (ICRAF), the Center for International Forestry Research (CIFOR), the International Center for Tropical Agriculture (CIAT), and the International Institute for Tropical Agriculture (IITA), four of the15 centers of the Consultative Group on International Agricultural Research (CGIAR), and their national partners. The World Agroforestry Centre (ICRAF) is the international leader in the science and practice of integrating 'working trees' on small farms in rural landscapes. The Centre works in more than 20 countries across Africa, Asia and South America. Headquartered in Indonesia, the Center for International Forestry Research (CIFOR) is a leading international forestry research organization established in response to global concerns about the social, environmental, and economic consequences of forest loss and degradation. Eurekalert: Report finds deforestation offers very little money compared to potential financial benefits - December 3, 2007. Mongabay: Carbon-negative bioenergy to cut global warming could drive deforestation: An interview on BECS with Biopact's Laurens Rademakers - November 6, 2007. According to the Philippine Department of Agriculture, Spanish biodiesel firm Bionor Transformacion S.A. is to invest US$200 million to develop at least 100,000 hectares (247,105 acres) of land into jatropha plantations. The company disclosed its plans to invest in the Philippines through a memorandum of agreement signed recently between AME Bionergy Corp. and the country's Agricultural Development and Commercial Corporation (PADCC). Madrid-based AME Bioenergy Corp. is appointed as the key integrator for Bionor in the country, and will conduct feasibility studies on the jatropha project, identify suitable jatropha plantation sites, organise and train farm labor, and install plantation infrastructure. Agriculture Secretary Arthur C. Yap told local media the PADCC will cooperate to facilitate the project. PADCC will assist AME to mobilise the Department of Agriculture's (DA) agencies and bureaus, as well as financial institutions, to help realise Bionor's investment plans. The project is part of Bionor's strategy to develop plantations on biodiesel feedstocks that do not compete with the food sector or contribute to deforestation. Bionor is currently operating two biodiesel plants in Spain and Italy with a combined output of 125,000 tonnes (137,750 tons). It is constructing five more plants in Spain and Brazil, which will add 900,000 tonnes (990,000 tons) of capacity in 2008. The Philippines has been listed by Ernst & Young as one of the most attractive developing countries for investments in first generation biofuels (see Q1 report and Q2 report). Its geographical location at the center of the rapidly growing South East and East Asian region, its biofuels legislation and incentives, and its relative abundance of natural resources are key factors determining this attractiveness. The Philippines' biofuels sector got a fresh impetus earlier this year after President Gloria Macapagal Arroyo passed the much-awaited Biofuels Act. The new act mandates minimum 1% biodiesel blending into all diesel from May this year and minimum 2% biodiesel blending from mid-2009. It calls for minimum 5% ethanol blending in gasoline from mid-2009, rising to 10% from around mid-2011. The Act also set up mechanisms to encourage investments in the local biofuels industry. EnergyCurrent: Bionor mulls Filipino jatropha investment - December 3, 2007. Visayan Daily Star: Spanish firm to invest $200M for RP biofuels - December 3, 2007. Inquirer: Madrid-based firm investing $200M in biofuel sector - December 3, 2007.